2.25" x 3.25" direct thermal, removable paper label for use with most consignment store applications. 1000 labels per roll / 8 rolls per case. Special features - Perforated, 2-Across. No ribbon required. 2.38" x 1.00" direct thermal, removable paper label on a 1" x 4" core. 1500 labels per roll / 8 rolls per case. BCW Quick Remove 1143825 special features - Perforated, 2-Across. No ribbon required. 2.50" x 1.00" direct thermal, removable paper label on a 1" x 4" core. 1500 labels per roll / 8 rolls per case. BCW Quick Remove 1144000 special features - Perforated. No ribbon required. 2.63" x 1.00" direct thermal, removable paper label on a 1" x 4" core. 1500 labels per roll / 8 rolls per case. BCW Quick Remove 1144100 special features - Perforated. No ribbon required. 3.00" x 1.00" direct thermal, removable paper label on a 1" x 4" core. 1500 labels per roll / 8 rolls per case. BCW Quick Remove 1145100 special features - Perforated. No ribbon required. 3.00" x 2.00" direct thermal, removable paper label on a 1" x 4" core. 800 labels per roll / 8 rolls per case. BCW Quick Remove 1145200 special features - Perforated. No ribbon required. 4.00" x 1.50" direct thermal, removable paper label on a 1" x 4" core. 1000 labels per roll / 8 rolls per case. BCW Quick Remove 1147150 special features - Perforated. No ribbon required. 4.00" x 2.00" direct thermal, removable paper label on a 1" x 4" core. 800 labels per roll / 8 rolls per case. BCW Quick Remove 1147200 special features - Perforated. No ribbon required. 4.00" x 2.50" direct thermal, removable paper label on a 1" x 4" core. 600 labels per roll / 8 rolls per case. BCW Quick Remove 1147250 special features - Perforated. No ribbon required. 4.00" x 3.00" direct thermal, removable paper label on a 1" x 4" core. 500 labels per roll / 8 rolls per case. BCW Quick Remove 1147300 special features - Perforated. No ribbon required. 4.00" x 4.00" direct thermal, removable paper label on a 1" x 4" core. 375 labels per roll / 8 rolls per case. 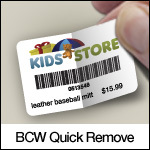 BCW Quick Remove 1147400 special features - Perforated. No ribbon required. 4.00" x 6.00" direct thermal, removable paper label on a 1" x 4" core. 250 labels per roll / 8 rolls per case. BCW Quick Remove 1147600 special features - Perforated. No ribbon required.